An exterior walkway is adorned with a Japanese maple, liriope, and miniature boxwood. The entrance garden to this beautiful home provides a welcoming feel to all who travel the bright white path to the door. On sunny days or on cloudy days, the colorful plants bring a feeling of peace and happiness. Your home's curb appeal casts its first impression, and there's nothing like a beautiful entry garden to increase the appeal of your home. An entry garden is as unique as the home it's attached to. While traditional homes may have more symmetrical gardens than modern homes, and larger homes may have larger gardens than smaller homes, all entry gardens have at least one thing in common—the ability to create a feeling of warmth and welcome surrounding the home. Entry gardens surround the walkway, driveway, or other way of entry to the home. Most entry gardens combine hard surfaces and soft plant materials. As a general rule, plants and trees should be proportional to the home's doors and windows; they should be neatly trimmed so as not to encroach on the entryway. Plants should also be in proportion to the walkways and driveways. There should not be so many plants that they overwhelm the hard surfaces, nor should there be so few that the area looks bare. In addition to plants and trees, every entry garden should have good lighting that not only welcomes visitors to the home, but provides a measure of safety. Lighting can also be used at night to highlight your entry garden so it can be enjoyed at all times of the day and evening. Depending upon the effect you are going for, you may choose plants and flowers in subtle hues, or those that provide dramatic splashes of color. Plants and flowers with different textures can also add impact to your entry garden. 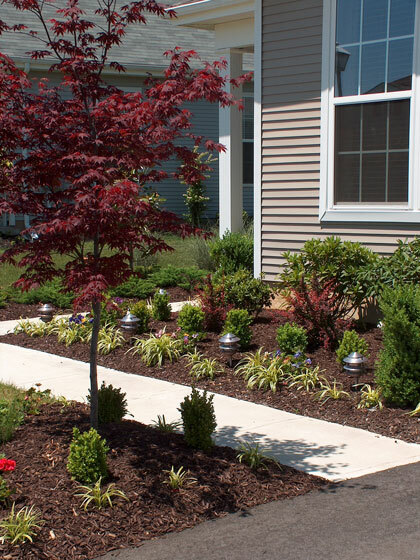 The color and types of plants you choose will depend upon what suits your home and walkway. While a variety of plants can be used in your entry garden, it's important that the plants complement each other as well as the home. When it doubt, it's best to use fewer plants that work well together. The climate you live in will also impact the plants you choose in your entry garden. In addition to ensuring that the plants you choose will thrive, you also want to ensure that complementary plants enjoy the same seasons. Knowing when flowers will bloom and when annual plants will die can help you develop a maintenance schedule so that your entry garden looks beautiful throughout the year.